The traditional law-firm business model has delivered technically excellent service at seemingly whatever cost. But the times have changed, with the global financial crisis only accelerating the price-down pressures, commoditization, and client demand for efficient, business-relevant services. To respond, law firms will have to go beyond cutting costs while preserving the general way they win work, produce work, and govern themselves. Law firms need to adopt business models that are better adapted to serve their clients not just today, but well into the future. To succeed under the changed circumstances, law firms need to remake their business models in accord with the needs of their commercial clients. 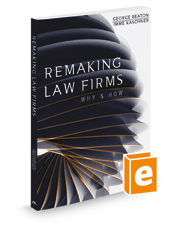 This book provides examples of innovative and successful business models from remade law firms. Ultimately, this book is meant to fuel a desire for change in law firms that goes beyond thinking and planning, and leads straight into the messy, frustrating, exciting world of implementing change, and ultimately to better client service.